Obama: U.S.-China climate change accord "historic"
BEIJING -- The United States and China unveiled ambitious targets Wednesday to reduce greenhouse gases blamed for global warming, aiming to inject fresh momentum into the global fight against climate change ahead of a make-or-break treaty to be finalized next year. In a joint news conference with Chinese President Xi Jinping at the end of the Asia-Pacific Economic Cooperation (APEC) summit in Beijing, President Obama hailed what he called the "historic agreement" between the two nations. He called it a "major milestone in the U.S.-China relationship," adding that it "shows what's possible when we work together on an urgent global challenge." Mr. Obama announced that the U.S. would move much faster in cutting pollution, with a goal to reduce emissions by 26 percent to 28 percent by 2025, compared with 2005 levels. Earlier in his presidency, he set a goal to cut emissions by 17 percent by 2020. Xi, whose country's emissions are still growing as it builds new coal plants, didn't commit to cut emissions by a specific amount. Rather, he set a target for China's emissions to peak by 2030, or earlier if possible. He also pledged to increase the share of energy that China will derive from sources other than fossil fuels. 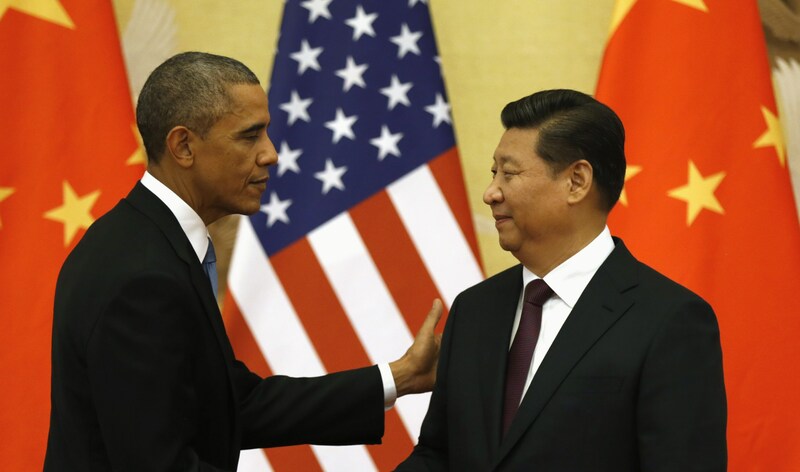 Together, the U.S. and China create more than one-third of all greenhouse gas emissions worldwide. The unexpected breakthrough by the world's two largest polluters reflected both nations' desire to display a united front on climate change, blunting arguments from developing countries that have balked at demands that they get serious about cutting emissions. Yet it was unclear how feasible it would be for either country to meet their goals, and Mr. Obama's pledge was sure to confront tough opposition from ascendant Republicans in Congress. "This is, in my view, the most important bilateral climate announcement ever," said David Sandalow, formerly a top environmental official at the White House and the Energy Department. "It sends the signal the two largest emitters in the world are working together to address this problem." The leaders hope to spur other countries to set ambitious targets ahead of a global climate treaty to be finalized next year at the U.N. Climate Change Conference in Paris. A senior administration official says the White House believes it has the authority to carry out these goals under existing laws, without additional action from Congress. The official pointed out that with Republicans taking control of the Senate, "we now have Congress's leading climate denier in charge of the environment committee," referring to Senator James Inhofe (R-Oklahoma), who will likely be the next chair of the Senate Environment and Public Works Committee. The same official said called the announcement "a major step forward," especially since the U.S. and China are often seen as the antagonists in climate change negotiations. "It will signal to countries around the world that this negotiation has serious legs and there is a real chance of this coming together," the official said.